SearchResearch Challenge (6/20/18): How big was the range of these animals? Going beyond avocados and onto animals! As you recall, one of important ways that avocado seeds were dispersed was through the gullet of large animals (like the gomphothere). Many of those animals are long gone--extinct. But they left an indelible effect on our landscape, leaving a trail of guacamole behind them. 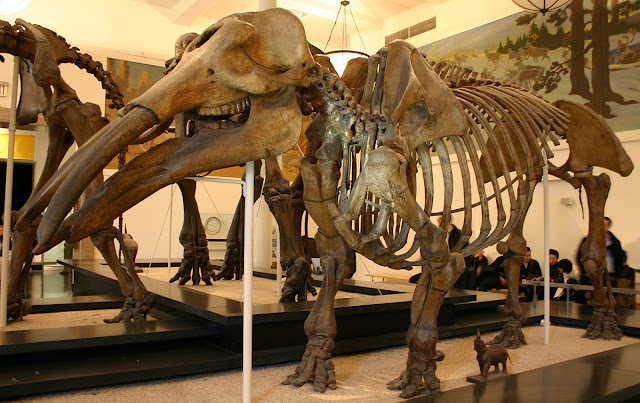 That made me start to wonder about those beasts and what the landscape must have looked like back in the day when gomphotheres wandered around through southern Mexico and Central America. If I recall my Pleistocene history correctly, there were a LOT of charismatic megafauna back then--including ones that we think of as being native to some other places. I associate sloths with South America, but there used to be really big sloths in North America as well (although there are none today). Likewise, I think of lions in Africa and camels in the Middle East + Africa. But it wasn't always this way. This leads to our fun SearchResearch Challenge for the week. If there were, once upon a time, lions and camels and ground sloths (Oh my!) in North America, what was their historic region? During the past 100,000 years, where could you find camels, lions, and ground sloths? Just as importantly, how do you do this search? What queries do you need to figure this out? Be sure to let us know in the comments. Share your knowledge about how to answer questions like this! ... that fruit beloved of millennials on their toasts, that mainstay of guacamole, that luscious green ambrosial centerpiece of tortilla chips... our lives would be poorer without it. As noted, that seed is pretty big. And that led me to this week's SRS Challenges. How would you work out the answers to these questions? 1. 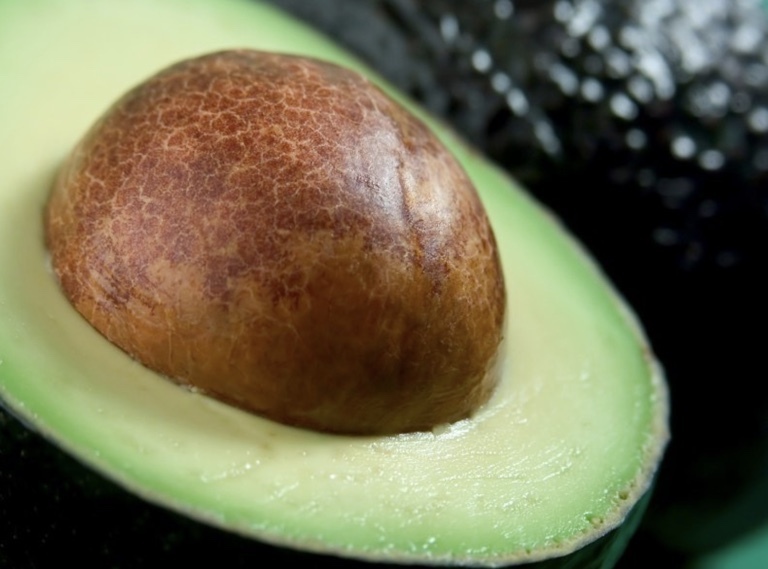 How are avocados dispersed? If they rely on just falling from the tree, that doesn't seem to work well... so is the "natural" dispersal by animal? If so, WHAT animal would eat an avocado... and then be big enough to carry it somewhere and leave it behind in a new place? "The plant hit its evolutionary prime during the beginning of the Cenozoic era when megafauna, including mammoths, horses, gomphotheres [a kind of giant, now extinct, elephant] and giant ground sloths ... roamed across North America, from Oregon to the panhandle of Florida. The fruit attracted these very large animals... that would then eat it whole, travel far distances and defecate, leaving the seed to grow in a new place." 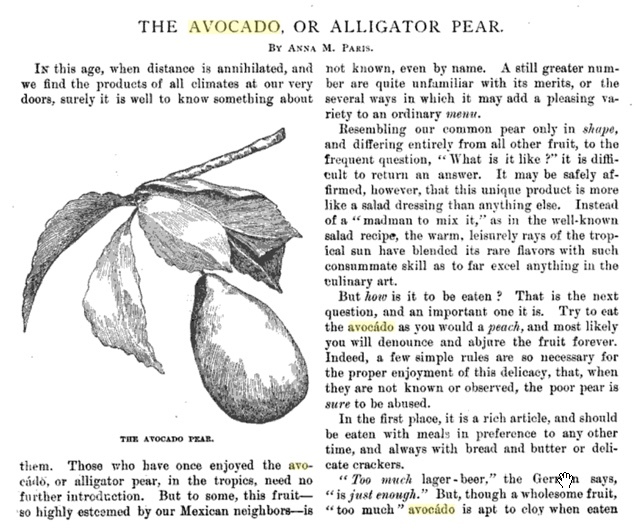 This article is based on the writings of Connie Barlow in magazines like Biodiversity (article about avocados) and Arnoldia (article about anachronistic fruits). Both are well respected journals). And she's author of the book The Ghosts of Evolution, which is all about this topic. To triangulate (that is, to get multiple perspectives on the same topic and look for agreements / disagreements). It's fairly easy to get multiple articles by different authors (e.g. National Geographic, Science...) all of which agree on this interpretation of events. 2. Are there other plants with giant seeds (like the avocado's) and how do THEY get dispersed? This category of "anachronistic fruits" (that is, fruits that evolved in a very different ecosystem that now holds) include seeds of the canistel tree, the honey locust, and the Osage orange. (From the Barlow article and that Science journal article.) These all have the property that the ecosystem is missing animals (that used to be around, hence "anachronistic") that can disperse the seeds. The fruits (and seeds within) are either large (Osage Orange, Avocado) or have a tough exterior (Honey Locust, Canistel). In all these cases, the hypothesis is that really large animals, such as gomphotheres or giant ground sloths, would eat these fruits, and then deposit them later after they'd passed through a large animal digestive system, which would prepare them for germination and growth. That is, these are really archaic fruits that literally belong to another time. And, in the case of the avocado, a strong case can be made that after the demise of the megafauna, it was humans that propagated the bizarre avocado trees, and their seeds. 3. 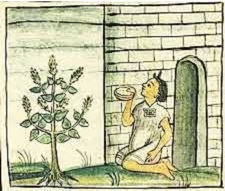 In writing this post, I’ve been looking for an early illustration of an avocado. It's kind of tricky. What’s a strategy for finding the earliest illustration of something? In our case, an avocado seed... but how about finding an early illustration of ANY thing? Here's what I did to find an early illustration of an avocado. Here's the first image I could find, from roughly 1590. This kind of query implies pic from a particular era. 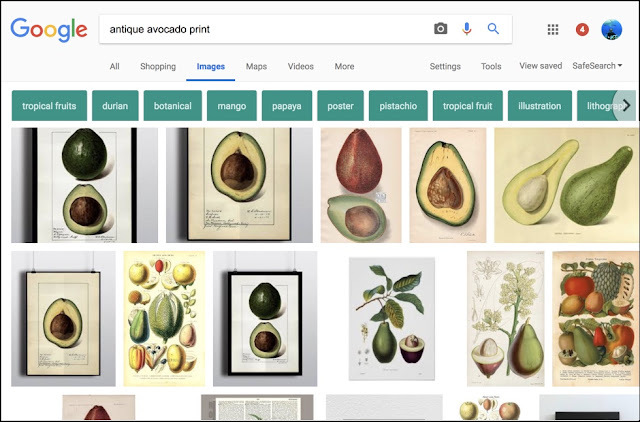 And in particular, this leads to a lot of older prints/illustrations of avocados. But none of these really push the date back to far, but it definitely gives us a bunch of early-ish prints. This appeared in Frank Leslie's Popular Monthly from 1891. (Monthlies from this era often contained extensive illustrations--perfect for this kind of thing.) I expect that more searching around would find more illustrations like this, and I leave this exploration to you. "Yaharo is a good port, with good lands and here are groves of many different sorts of edible fruits, among others is one which looks like an orange, and when it is ready for eating it turns yellowish; that which it contains is like butter and is of marvelous flavor, so good and pleasing to the palate that it is a marvelous thing." 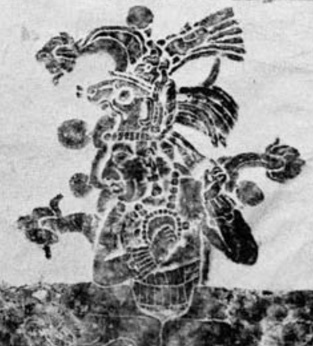 "[in this diagram] Every figure emerges from the earth, and behind each of them there is a tree with fruits that include the cacao, avocado, soursop (Annona muricata L.), and chicozapote (Manilkara zapota )..."
with a reference to another paper, "Observations on the Cross Motif at Palenque" by Linda Schele, published in Primera mesa redonda de Palenque (a conference on the art, iconography, history of Palenque). The oval things are avocados. The Temple of Inscriptions was completed around 683 AD, so I'd argue that this is probably the first illustration of an avocado--literally carved in stone. That's probably the earliest depiction of an avocado that I could find. 1. Using the right terms (e.g., dispersal) helps a lot! In this Challenge, I gave you a big clue. A precise, relatively rare term can help a lot. 2. "Reading around" in the literature can give you many other terms for searching. In my case I learned about "anachronistic fruits," which then opened up an entire literature for perusal. 3. There are many ways to find old illustrations--(a) working from the literature, (b) adding in a context term that suggests age, (c) searching for illustrations in books, (d) searching explicitly for "early illustration." There are other ways that we'll cover in the future, but this is a good start on a short list of methods to find older pictures and illustrations. I'll be back next week with another update, and a new Challenge! Last week we had a survey. Since I do surveys professionally (for my research work at Google), I know this isn't a perfect survey. The sample size is too small, too biased towards professional researchers, and doesn't have a broad enough set of questions to be accurate. What I wanted from this survey is a sense of what experts think about search advice. That is, I really wanted to hear what you, gentle reader, had to say about search methods and conducting online research. The good news (for me) is that many of the ideas you put into the survey are covered in my book. The better news is that I don't cover everything you mentioned. To everyone who filled out the survey, many thanks for your comments. They were thoughtful and had great insights, including a few that I hadn't thought about before! We'll cover some of these in future posts. Analysis: We got 48 responses from readers. I was hoping for a bit more, but this is a great foundation to start. There were also 4 questions, so that's 192 responses that I'm summarizing. All I did was to read through all of the responses and summarize the themes I saw. Each of the items below was suggested by more than one person. The rank order reflects the number of times each was written about. #1 in the list was the most common, #2 was second most common, etc. Here's what you said, with a short explanation / summary afterwards. We've talked about this in lots of SRS posts--a very important skill is that of reading and learning from your search experience. In classes, too often I see people not reading the results page and consequently NOT learning what worked or didn't work. Careful reading and thinking about what your search returns leads to learning, and learning leads to better searching in the future. When you search for something that's more than just a simple answer, you often need to find the context that surrounds what you find. This is especially true for complex topics such as social or historical questions. Just reading a single web page (or, God forbid, reading only the snippets on the SERP) almost never gives you enough context information on the topic. Read widely, and learn the when/where/why/how about your topic. I'll be writing much more about this in weeks to come. My colleagues Sam Wineburg and Sarah McGrew (Stanford) have written really well about this and why you'd want to do lateral searching. See: Lateral Reading (Sept, 2017). I'll be writing about some effective strategies for doing this. Limiting the scope of your searching is simple, if you know how to use site: or filetype: -- those are the simplest ways to get results with certain kinds of properties. You use site: when you want results from a particular web site or organization. Thus, [site:CDC.gov influenza] will give you results with a distinctly CDC perspective. Likewise, you can exclude certain sites with the minus operator. [-site:CDC.gov influenza ] Or you can search multiple sites or entire domains: [site:.IN Brexit OR site:.BE Brexit] will search for "Brexit" on Indian or Belgian sites. Yes! This is critical... and requires much more discussion than I have room for here. We'll return to evaluation rules-of-thumb in future blog posts. This is a great way to find advanced, expert content on a topic. The trick here is to locate experts that are truly expert (why do you think they're an expert?) and then tracking down their writing. The other trick here is to always locate more than one expert. Ideally, you want to see the varieties of thought on a topic (there could be more than one point-of-view... in some cases, there can be 4 or 5! ), and get experts from each perspective. A critical thinker is always wondering how could this be wrong? And how can I break this big problem down into pieces? There are many approaches to critical thinking, but these two heuristics work well for me. A critical thinker criticizes an idea, some writing, or a point-of-view... but does so productively, not to just be mean-spirited about it. Critical analysis is trying to break something into its components to understand how it works. It does not assume that authorities are always correct, but calls things into question. (This is why critical thinking annoys some people.) Of course, you want to do your critical thinking with care, and not be annoying about it. But it's an essential skill. Persistence in the face of failure is the #1 attitude (or trait) that was mentioned by those surveyed. I agree. It's obvious in my search classes when someone has this attitude, and when they don't. Much of what I teach is attitude encouragement. "If that didn't work, what do you think would work?" And "Just try one more search.."
Adaptability is just the ability to respond to changing circumstances. In online research, it's the ability to act effectively when things go wrong (e.g., getting 404 errors, finding that your favorite website no longer supports that service, etc.) You'll also find that you need to adapt to changing tools (new features introduced, old ones go away) and data. These answers were pretty interesting, and all over the map. Here's my condensation of the top 10 ideas. I was surprised about how many people said this. Aww.. gee... thanks! 3. Who would know the answer to your question… how would they put that info online? This is a variation on the "find an expert" heuristic from above. But I like it as a heuristic for asking questions too. How would an expert think about your question? That is, ask why about the answers you’re finding. Why is this true? And How do you know? This almost always leads to a better question. One way to create a question is to think forward to what an answer would look like. That is, if the answer looks like this, what question would let me get to that? 9. Ask yourself WHY do you want to ask this question. This is a classic library reference desk question. A great reference person always tries to dig into what you want to know.. and why. Knowing the answer to why tells you a lot about how to frame your question. 10. Be open to nuance. Don't give up on the subtlties of a question. You can almost always ask "Is there more I should know?" That's a useful question in almost all cases. 2. don’t limit yourself to English and US sites. 6. consider the motivation for whoever is writing whatever you’re reading. Why did they write this? Why did they post it? There's obviously a lot that's been packed into these answers. I'll be unpacking some of these themes over time. You'll be amused to know that the attitudes section is almost exactly what I cover in chapter 19 of my book. Thanks for confirming my intuitions! See you next week when we discuss the answer to the mysterious avocado seed question! Once you figure out the answer, let us know... AND be sure to tell us HOW you figured it out! I'm curious to see what your "old illustration" strategies will be.